Convert MOV to M4V, MP4, AVI, MKV and other TV supported formats. Have you ever tried all efforts to play favorite MOV (QuickTime) file on TV but still got frustrating result? There's a smarter and quicker way to help you get rid of such issue, simply convert MOV to TV-supported formats, be it WMV, MKV or MPEG-2. To perform MOV to TV conversion, you'll need the assistance of Wondershare Video Converter Ulitmate, which is popular for its professional converting features, simplified user interface, guaranteed lossless quality, etc. The following guide will show you how to play QuickTime files on TV in 2 parts. Before getting started, please download Wondershare MOV(QuickTime) to TV Converter here and launch it after installation. Now let's move to the step-by-step tutorial below. Hit Add Files button to browse through your local directories and import the QuickTime or Camcorder QuickTime MOV files you'd like to convert to TV. You can also directly drag and drop MOV files to the converter. Click the drop-down icon beside Convert all files to: > Device > TV and you'll see some optimized TV sets for specific devices. If you want to play it on an Samsung TV, simply select Samsung TV with default parameters. If you're familiar with video settings, you can manually adjust the bitrate, frame rate or resolution by clicking the + Create Custom, which would assure you a better conversion quality. Hit Convert All on the bottom-right corner of the interface to kick off the MOV to TV conversion. 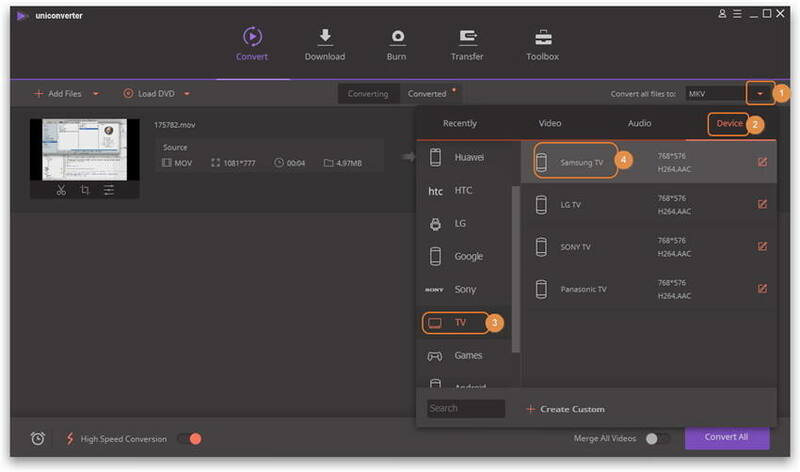 Now, you can sit back and leave it to Wondershare MOV to TV converter to finish the rest conversion for you. When the conversion completes, you can transfer the files onto your hard drive and then play it back on your LCD via the HDMI or USB cable. As a matter of fact, there are various kinds of smart TVs available in the market, so in this part, we'll set Sony TV as an example to show you how to play Quicktime files on TV. First of all, you need prepare this 2 things. Computer connected to the same Wi-Fi Connection. Step 1. Choose Wi-Fi Direct Mode. Press the Home button on your remote control and choose Applications > Wi-Fi Direct Mode. Step 2. Launch Wi-Fi Direct Mode. Press Options on your remote control and select Manual. Then choose Other Methods, you'll see the SSID and WPA key, just enter them on your laptop. Step 3. Connect Laptop to TV. Choose Network settings on your laptop and find the name which matches the SSID you got on TV. And then enter the WPA key to connect your laptop to TV. Step 4. Play MOV on TV. Now you'll be able to select the MOV file you want to play on TV, right-click the file and choose Play to TV name afterwards. 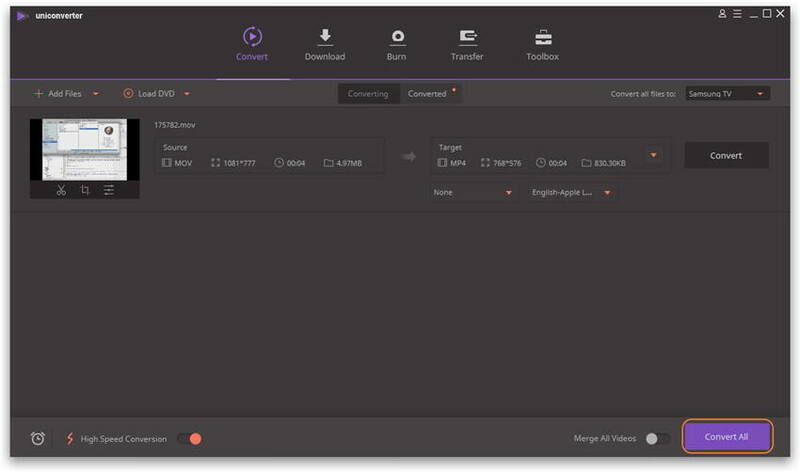 Since we're proficent in using Wondershare UniConverter (originally Wondershare Video Converter Ultimate), we conclude 3 useful tips for you to make full of it to play MOV video files on TV. Please check in turns. Wondershare UniConverter (originally Wondershare Video Converter Ultimate) enables you to burn a QuickTime MOV file to a DVD for playback on home DVD player. To sum up, click Burn section on top of the intperface and load the MOV files you'd like to burn, select your favorite template to burn the MOV files onto a DVD for playback on the TV and click Burn to proceed. Before burning, you can choose the TV standard, either the NSTC or PAL, to better cater for your playback needs. 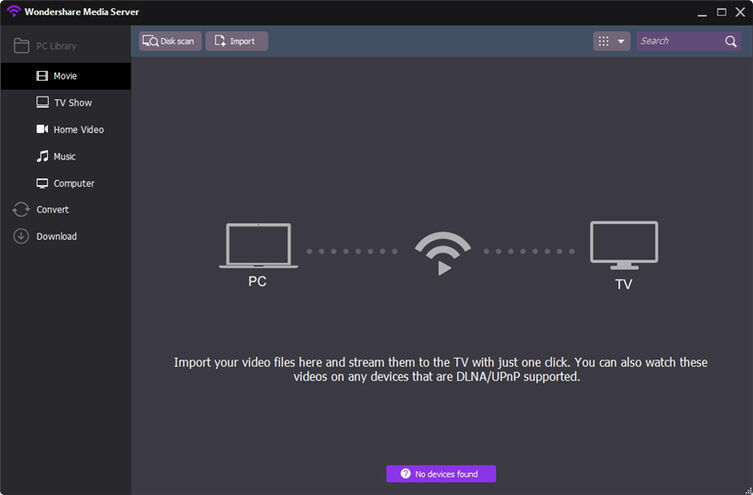 Wondershare also supports casting to TV, which streams any video files to TV while playing them with the built-in player. 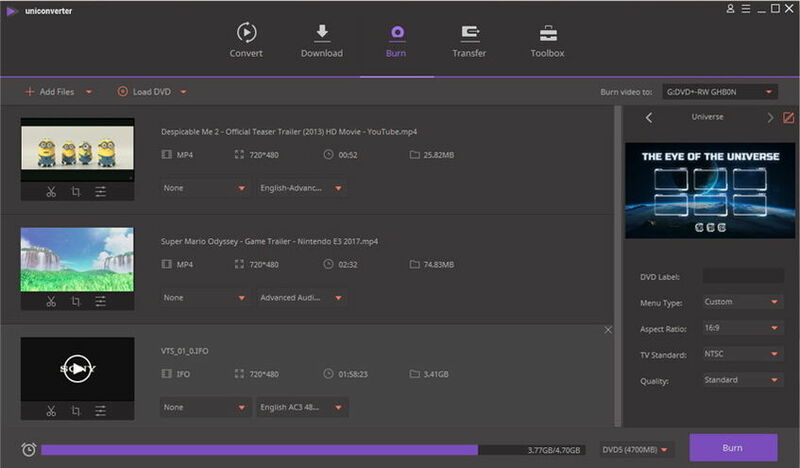 All you need is to access Cast to TV funtion from Toolbox in the top and add your target MOV files for playback, then conect your computer and TV with the same network and play QuickTime MOV files within the program, and the MOV video will be successfully streamed to TV. 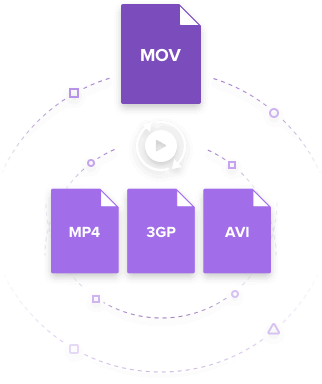 If your QuickTime MOV file is encoded by H.264, you can take advantage of the zero-quality conversion mode, which means the conversion will be carried out on your source files without decoding. Namely, keeping your original file intact. However, if your MOV file is encoded by other codecs, you'd better adjust the video parameters to minimize the quality lost during conversion. So with Wondershare UniConverter (originally Wondershare Video Converter Ultimate), you are able to convert the video for the TV easily and quickly transfer them to TV for enjoyment. If you are quite interested in this program, just free download and have a try!